I think one suggestion I read (maybe in this thread) is people need a certain amount of posts before they at least post in here. now, you would still have people viewing it, but it would at least make it harder to post here and give mods a chance to try to kick potential creeps out. This. The amount of <50 post bans in P101 are still common and well yeah this will certainly help to keep them out partially. I don't get why you're fighting so much for P101 if didn't post there, not this year at least. Why? Because I actually want VT to be creep free. You know P101 has a problem. It also affects the group of people joining VT in general. Girls on VT getting unwanted attention from drooling guys etc. No, I don't. I don't know why P101 is a problem. I posted earlier in this thread that I do not think the archives are a problem. If you do not post in P101, are you worried about P101 people invading the rest of the forums or are concerned with just P101? Extremely explicit content. Creeps. The fact the archives are viewed by 100+ people all the time who are most likely old men. The fact other forums don't see as many frequent posters as P101. The lack of maturity of some posters. The fact they seem to see girls as objects who they can just drool all over. Have you ever checked the Archives? Most of it is viewed by 100+ people, sure, but what are they seeing? Here's a screenshot of a page of the archives, page 1000 out of 1760. I chose it because it's a round number and has some pretty old threads, but I didn't choose it regarding quality of the locked threads. I don't see that much that would call old men's attention, or anything that objectifies women. The posters might be 13 and confused with hormones, are you expecting them to be too mature? You're 17 and I'm 20, we're on another level, come on. Also, if you want more traffic outside of P101, why would you cut the source of a lot of traffic to VT? Locking the archives would not accomplish more traffic. That doesn't seem to be true, rather, the distribution seems to be even and proportional. The P101 archives has 1760 pages of threads, accounting for 76% of all threads in the P101 subforums. At the same time, 70% of all users are looking at the Archive, a 6% difference in favor of the newer threads. In favor. Even at a 99% confidence interval, assuming 237 (current users online) the sample size and 8836 (the record amount of users), there should be 70±7.6% of people on the Archives. 99% of the time, statistically, will the Archives be equally or less populated than the remaining P101 forums. Come on. Last edited by Elysium; August 1st, 2016 at 07:53 AM. @Typhlosion You were talking about the ENTIRE P101 forum in general, not just the archives. What bothers me in the archives is that you have 100+ people drooling (and you have no idea how old they are or what they are doing) . Would you find the idea of a 50 year old masturbating to a puberty forum appealing? Well me neither. I never said to cut the source. I said to regulate it. Make it member only. That takes away the disturbing amount of constant views. Also the post limit can make some creeps think twice about joining. So that means 76% of the threads were locked? Well those guys better get the rules thrown at them aswell don't you think? Locking the archives to members only wouldn't exactly reduce traffic either since the other 2 forums are still there for people to see, and for people to post in. Ok, let's add my opinion. I haven't really read through all of this so apologies if things come up twice. Making the archives member only is a ridiculous idea. Many of these threads are found quite high up on google, and to make this member only will just increase the number of repeat threads. And to have post limits I think is a bad idea as well. Many people join up to post in P101, and some (though I should say few) members eventually expand and start posting in other forums. So restricting P101 would mean we would have few new members. I highly doubt the P101 Archives would ever be made members-only, and for a very simple reason. Which of these scenarios do you think is better? 1. P101 Forums continue to not be private, and possible "40 year old dudes" (as an example) continue to do what they do - lurking around and browsing these forums from a distance, with the chance they are using this forum as some sort of entertainment...to put it mildly. 2. We make the P101 Forums private, and pretty much take their amusement away from them...probably causing a large and permanent increase of members (these very same "40 year old dudes") joining just for the ability to continue to browse the P101 Archives. This gives us a lot of new members, sure - but at what price? The ones who are browsing the Archives and have new accounts now have access to our other members and can communicate with them. There is a serious safety issue here, and one that I do not like. I happen to take a lot of pride (and personal responsibility, to be honest) that we provide a safe environment to our members. We do catch a great deal of these people who register, as it stands...but we are talking about potentially dozens more every day. Sure, it's our job as Staff members to do our best to stop the overage people and the ones who have every intention of being inappropriate - from being around other members. Members with actual puberty issues. Members who have been victims of abuse and sexual assault. Members who self harm and/or deal with thoughts of suicide. Members who deal with emotional, mental, anxiety, and self-esteem issues. Can you imagine if we encourage "Archive lurkers" to register here on VT? We'll be dealing with even more predators than we already do, and you can make a very strong case that we are putting vulnerable people in a lot of danger. This is why I could support either leaving them public or making them private. I have read your whole post and yeah I agree with everything but I was thinking that if p101 was private then the creeps that stumble across this site won't see the sexual nature of p101 so might just move on? Whereas now they lurk and many still sign up to interact. If the whole of P101 was private, then legit potential members wouldn't be able to see it either. Also, like it or not (and I don't, personally)...but results from puberty searches do bring the most traffic to VT as a whole. Just my opinion - it's an "unfortunate reality." I don't agree with it, but I don't agree with the forum as a whole fading away because not many people discover it either. Either way, creeps are going to be creeps no matter what is done or not done. It's best that we keep them at a distance rather than encourage them to actually sign up. Last edited by Emerald Dream; August 1st, 2016 at 11:59 AM. Okay, what makes you know they are 50 year olds masturbating to this? You also "have no idea how old they are or what they are doing". You are also assuming. Why are you assuming this? 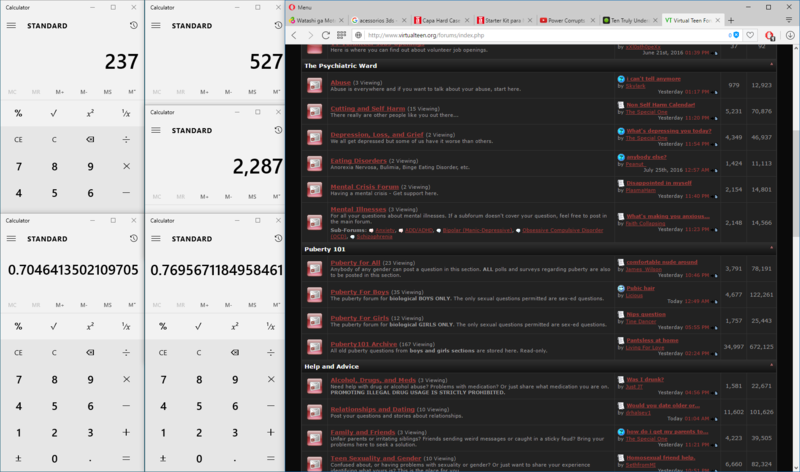 That's also constant views to the whole VT forums, and an increase of spam? No, it doesn't. It means that old threads are moved there too. If you had bothered to look at my screenshots, most of the threads in those (albeit non-representative) two pages were OK. They weren't creepy or the first thing you think about when you speak of the P101 Archives. There are many legitimate threads there. For your sake, I opened 40 threads of P101 stuff just to comment on their quality and write that on the screenshots. In fact, if you go to the last page of threads in Puberty For Boys, the most recent thread was last posted in 2013. VT is much older than 2013, that means that older threads were moved to the archives. Also, in what world would cutting 70% of P101 traffic and at least 30% of VT's total traffic be a good idea? In what world it "wouldn't exactly reduce traffic either since the other 2 forums are still there for people to see, and for people to post in."? Yeah you're right buddy! It is a difficult one but you've swayed me to the keeping it public side! I am assuming this because it is the internet and there are enough people here who lie about their age and gender. It's the internet, think about it. Constant views yes, not 100+ at a time. I think we both have different 'limits' when we see threads as creepy here. It wouldn't cut the trafic. It would make it member only. The other 2 P101 forums will still remain if archives are made private. It would cut views, not posts. I don't think arguing about who or what accesses the internet, neither both of our assumptions, would help anything. Keep in mind that the internet has evolved and most, normal humans, access it too daily. Agree to disagree? Either way, that's up to H&A moderation and not either of us. Frankly, I don't think that's going to change nor should. But I could be projecting. I don't get it, are you worried about server overload or the sheer amount of "creeps"? The former really isn't an issue, I can see what you're going for with the latter, but still not agree. I'm not sure you understand how traffic works. Google, and other search engines, have "spiders" that browse and index the whole web, including forums like VT. 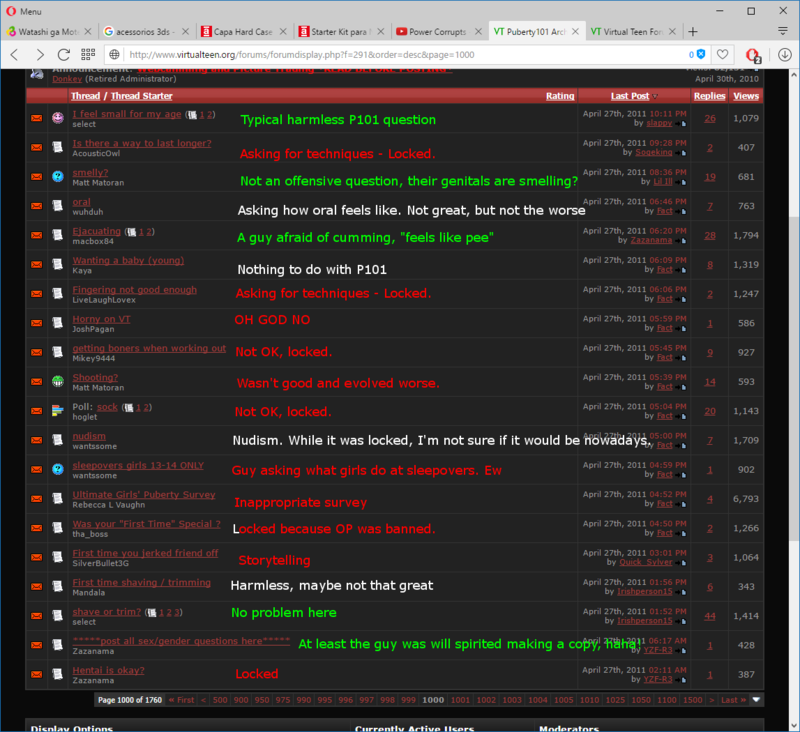 Previous crawling indexed many of the forums here on VT, including those in P101. Because threads are not organized by Sub-forum, but instead by an individual code (example: http://www.virtualteen.org/forums/showthread.php?t=2027646) moving them to the archives should have a lesser penalty on its indexing. If, however, the P101 archives were made private, then the crawlers would not be able to access them (as the spiders are not logged in). That would make many links in search results to no longer appear. Those 100+ users might not get here in the first place to then switch to the other active P101s. Or, even if they do, they'll reach page saying they have to register to see the previously public thread and be immediately dissuaded from browsing the site more.